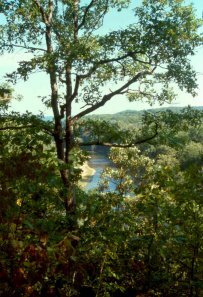 The Meramec River becomes a trout river below its confluence with the flow from Meramec Spring near St.James, Missouri. The inflow of the Spring's cold waters make the next 8 miles a trophy trout area. In fact, in 1974 it became Missouri's first Trophy Trout Area. The Meramec is primarily managed for brown trout, but the river does contain a good number of rainbows that have migrated from Meramec Springs Park. In 1997 there were an estimated 640 trout per mile in the Meramec River. In 1996 nearly 15 percent of the River's trout were classified as trophys. The Meramec River, with its substrate of small shifting gravel, is a very different river than Missouri's other trout streams. Techniques that work well on other rivers more often than not don't work well here. With the correct strategy the Meramec can be a joy to fish. The nearby area is the heart of Missouri's grape growing region. In the fall local grape growers will fill your creel with their trophy.